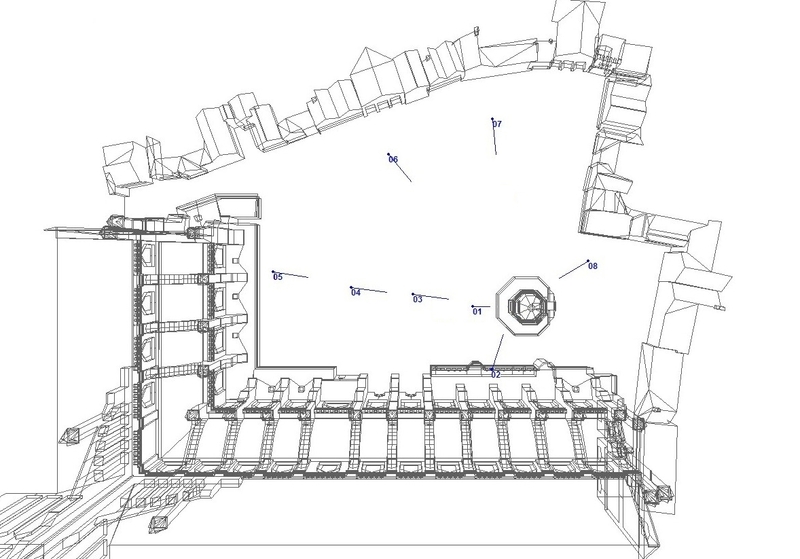 Figure 1: Wireframe Image of the Acoustic Model, Paul’s Churchyard, the Cross Yard. Wireframe from the Visual Model, constructed by Joshua Stephens. 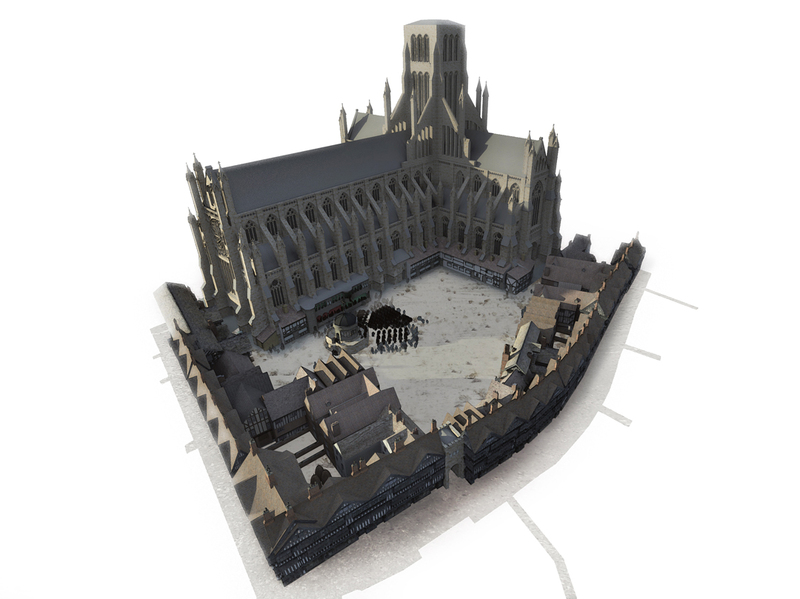 The Virtual Paul’s Cross Project helps us clarify the physical and auditory experience of listening to sermons delivered in Paul’s Churchyard. To experience a portion of Donne’s sermon for November 5th, 1622, heard from eight different positions in Paul’s Churchyard and in the presence of four different sizes of crowd, go directly to the Test of Audibility page. Claims for the importance of Paul’s Cross sermons suggest that these sermons were central to the development of the reformed Church of England in the sixteenth and seventeenth centuries and for the creation of a public space and a public, urban identity in a city undergoing rapid population growth and in a time of the expansion of centralized governmental structures. 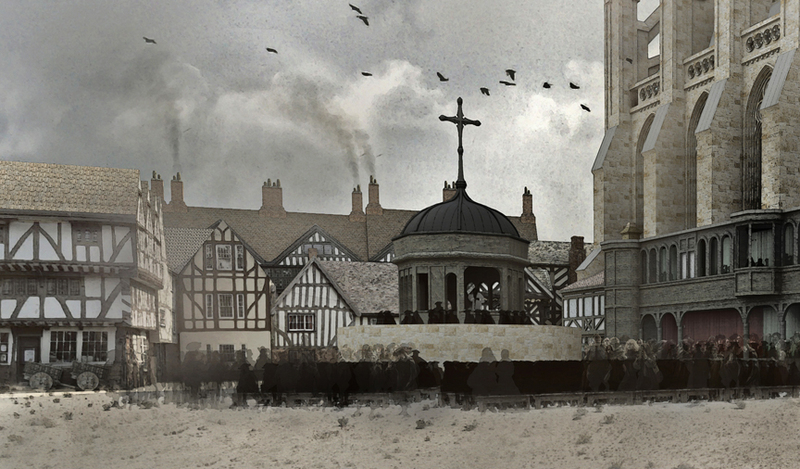 Thus the Paul’s Cross sermon is argued to be an occasion for the gathering of the nation in microcosm, where the monarch’s role as Supreme Governor of the Church, the Church of England’s role as a national church unifying all the people before God and king, and the City of London’s role as the center of national cultural, political, and religious life were acted out before a significant gathering of Londoners and visitors to the city. Figure 2: Paul’s Cross, from about 75 feet. From the Visual Model, constructed by Joshua Stephens, rendered by Jordan Gray. Such claims hinge on the Paul’s Cross sermons being delivered to a significant percentage of London’s population who could hear what was being preached to them, relying on the strength of the unamplified human voice in a large open space in the midst of a noisy and bustling city of some 200, 000 people as well as large numbers of horses, dogs, birds, and other sources of competing sounds. Among all the possible sources of ambient noise we might have attended to, we have chosen the horses, dogs, and birds, which common sense, as well as the details of Gipkin’s painting, remind us were very much part of the London urban scene in the seventeenth century. Certainly, the question of audibility to some degree varied from preacher to preacher as a question of the preacher’s skill in public speaking, in speaking energetically, resonantly, and with good breath support for the voice. The space the preacher was trying to fill was approximately 185 feet wide and 150 feet long, although his most important audience — the persons of position who sat in the Sermon House — were only about 40 feet away. We know from contemporary accounts that there were issues with audibility; for example, John Whitgift, Archbishop of Canterbury at the end of the reign of Elizabeth I, is reported to have said of Paul’s Cross that “those behind, or on the sides, cannot so well hear as thoose that be before” the pulpit (Whitgift 2, p. 463). In one of his sermons from 1627, Donne acknowledges there were those who “were not within distance of hearing the Sermon” who would decide the sermon was good or bad because they could hear and note “the frequencie, or paucitie” of the “acclamations” of those close enough to hear what was being said (Donne, Sermons, X, 134). Contemporary estimates of the size of congregations for these sermons range as high as 5,000 to 6,000 people. Early modern depictions of Paul’s Cross sermons are of course far more representative than they are accurate, but the Gipkin painting shows the most folks in attendance. I have counted the number of people shown listening to the sermon in this painting several times and gotten different numbers each time, but the numbers I got every time never ranged higher than 250. Figure 5: Detail, John Gipkin, Painting of Paul’s Cross (1616). Image courtesy of the Bridgeman Art Library, New York, and the Society of Antiquaries, London. The folks sitting in Gipkin’s painting of a Paul’s Cross sermon seem comfortably arranged, with plenty of room all around them. On the other hand, this image — which shows a larger crowd in attendance for a Paul’s Cross sermon than any other contemporary image — shows fewer than 250 people in attendance. Whether the crowds actually ranged as high as 6, 000 people or more, or a more reasonable crowd of half that size, or a crowd more like the crowd in Gipkin’s painting, however, it is a bit sobering to realize that even the largest crowds that could possibly fit inside Paul’s Churchyard with any hope of hearing the sermon represented, even in the best possible scenario, approximately 3% of London’s population in the early seventeenth century. Figure 6: Paul’s Cross from 25 feet. From the Visual Model, constructed by Joshua Stephens, rendered by Jordan Gray. Once they arrived, however, and so long as they positioned themselves in front of the Paul’s Cross Preaching Station, they actually had a pretty good chance of hearing what was being said by the preacher. Our acoustic analysis of the space between the Cross pulpit and the north transept of St Paul’s suggests that people could have heard the preacher well enough to understand him even if they were standing 140 feet from him. Ben Markham, the acoustic engineer who supervised the acoustic modeling for the Virtual Paul’s Cross Project, writes (https://vpcp.chass.ncsu.edu/engineers-report/) that the shape of the space around the Cross pulpit – formed by the cathedral and the booksellers’ shops — created a kind of theater for listening. Figure 7: Paul’s Churchyard, overhead view, from the north east. 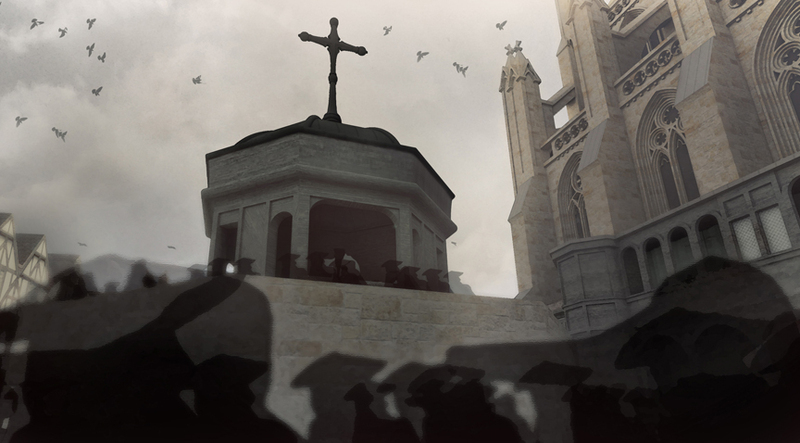 From the Visual Model, constructed by Joshua Stephens, rendered by Jordan Gray. Crystal “delivers a speech consistent with a practiced orator delivering a speech to a great outdoor crowd: the voice is strong, the cadence measured,” writes Markham. Figure 8: Paul’s Cross from 50 feet. From the Visual Model, constructed by Joshua Stephens, rendered by Jordan Gray. In addition to the influence of the acoustics in Paul’s Churchyard, there is also the question ambient noise, the presence of sounds in this space that would have influenced Donne’s congregation’s capacity to understand what Donne was saying in his sermon. 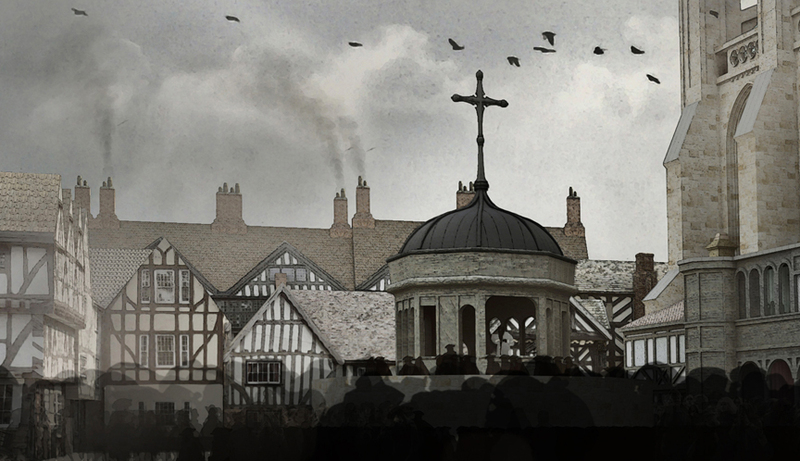 The world of early modern London – noisy though it was – was still quieter than our post-industrial world. Figure 9: Chart showing fall-off in sound levels from 10 feet to 150 feet from the preacher. Chart courtesy Ben Markham, Acentech, Cambridge, MA. 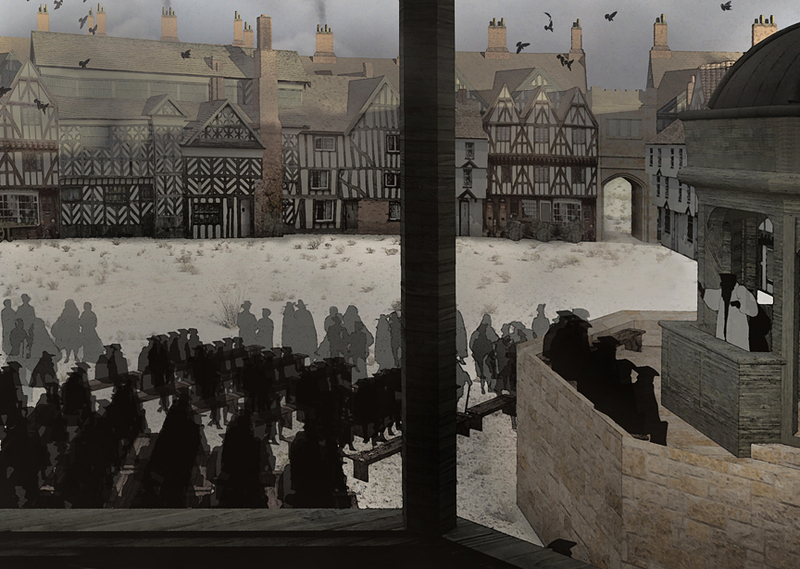 The Virtual Paul’s Cross Project’s website permits the user to sample Donne’s sermon from eight different locations in the Courtyard and with 4 different sizes of crowd. Figure 10: Paul’s Cross from the Sermon House. From the Visual Model, constructed by Joshua Stephens, rendered by Jordan Gray. Especially interesting is to compare the sound of the preacher’s voice when one listens from Position 2, the Dignitary’s Box in the Sermon House to the preacher’s left, with other positions on the ground level of the Churchyard. The preacher’s voice is much clearer from the Dignitary’s Box, although more clearly reverberant, than it is from other listening positions; clearly here as in other circumstances, rank has its privileges.